When second-year medicine student Madeline Goosmann looked for a place to spend the summer as a researcher, she opted for a major change of scenery. Goosmann packed her bags and traveled to UniversitätsSpital Zürich (University Hospital Zürich) in Zürich, Switzerland, where she studied Ménière’s disease—a condition characterized by dizziness and ringing in the ear. 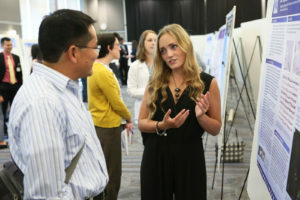 Goosmann was one of more than 75 of NEOMED students from the Colleges of Medicine, Pharmacy and Graduate Studies who presented their work August 18 at the annual Summer Research Fellowship Program Poster Day in the NEOMED Education and Wellness (NEW) Center Ballroom. Jianxin Bao, Ph.D. (shown in photo), the director of NEOMED’s Translational Research Center and a member of the University’s Hearing Research Group, stopped by to chat with Goosmann about her research during the poster event. Michael Kelly, M.D., Ph.D., and Chief Research Officer for the nearby Akron Children’s Hospital, also joined the students in the poster-lined aisles and later shared his own thoughts about research and a career in medicine during his keynote address. With an unbeatable view of the Alps from her apartment window and fascinating research to keep her occupied, Goosmann considers her time spent in Switzerland’s largest city a success. She was especially captivated by the diagnosis of a 49-year-old man who was experiencing symptoms related to Ménière’s disease 39 years after suffering from a temporal bone fracture. In a search for different causes and improved treatment options for the disease, Goosmann and her team found primary cilia and calcium sensing receptors in the endolymphatic sac.